In the previous discussion we arrived at a point where we could determine where the robot end-effecter was positioned if we knew the angles of each axis. Unfortunately, this isn’t what is typically necessary for an industrial robot. Normally, we need to know what angles will get us to a known point in space. This problem is termed Inverse Kinematics. This process becomes complicated very fast when the configuration has more than two joints so we will stick with two! 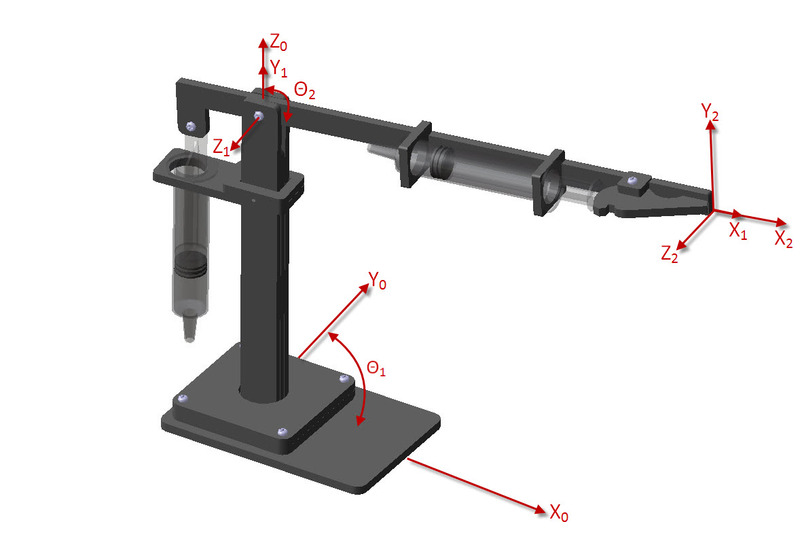 In the department we have previously made syringe robots as pictured below. The syringes are coupled with mating syringes through hoses and air pressure is the manual control method for the small robot. The forward kinematics have been performed based on the previous discussion and are included below. d1 and a2 vary from robot to robot and are measured values. 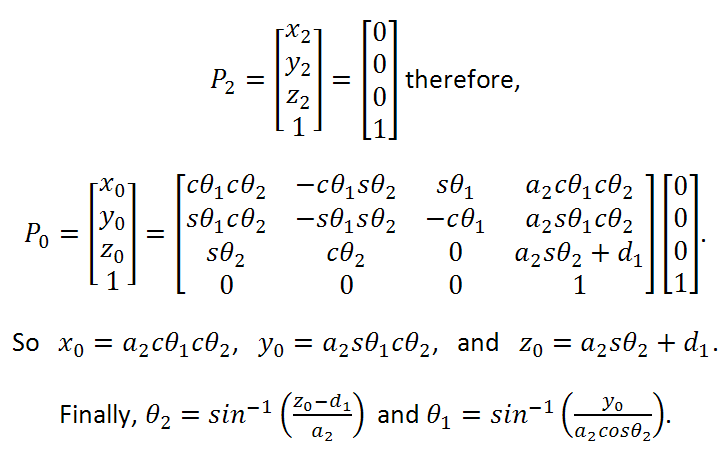 To perform the inverse kinematics and equation is generated for each x, y, and z when the point of interest at the end-effecter is assumed to be [x y z] = [0 0 0]. Up to this point the process has been the forward kinematics process but the next step is what characterizes the inverse kinematics. After x, y, and z are solved for we must turn it around and solve for the joint angles, Ѳ1 and Ѳ2. Now that we have the inverse kinematics solution we are able to solve for joint angles if given a required point in space with respect to the base coordinates. For example, if in the given example above, it was necessary for the robot to travel to the point in space [x, y, z] = [ 136.151, 36.482, 151.303 ] and we measured d1 to be 100 mm and a2 to be 120 mm then we could solve for the joint angles by plugging in and solving for x, y, and z.
Plug the values in and make sure you obtain Ѳ1 = 25.3 and Ѳ2 = 19.6. HOMEWORK: Show the procedure to find T given above and show the process required to obtain the equations for the both angles. Give the angles required to move this robot to the point [x,y,z] = [70.42, 59.09, 177.13]. Can you e-mail me the specifications on how to build your Syringe robot? Unfortunately, I do not have access to the necessary information to make the robot. Someone else made kits for me long ago. However, a bit of playing around with some syringes and tubing should get you started.